Burning Moon's Inside advice: Grand Box! My grandmother has gone through a lot over the last few months, she badly broke her leg in early May and ended up with a plate, a bar and several screws in her leg. Afterwards she was sent to a rehab facility to help the leg heal and learn to walk on it again, she was released at the end of July but that wasn't the end of her story. One of the screws that was p...laced into her leg has started to come out and is on the verge of coming completely out of her leg so she has to get her leg re-opened and repaired in two weeks. Needless to say it has been an emotional and busy months for all of us. 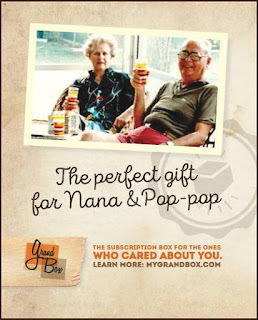 When I saw the chance to do a review with Grand Box I knew I had to take the opportunity especially with Grandparents day coming up.